Being a SAHM is challenging, but oh so rewarding. I swear less seems to get done than used to when I was teaching full time. Granted I can not compare life now with a year ago. Hello silly, you have an almost nine month old little boy now. It takes time to nurse, feed, diaper, play with, snuggle, read to, and dance with JSL. Every so often when I am in a rush I stop myself to slow down and enjoy things. I will not get these moments back where he will laugh at anything and everything his big brother says and does. In a short time this sweet giggling and playing will be replaced with sibling squabbles and screams. Ah, the things to look forward to. Yesterday after NHL came home from school we decided to do some craft time (other than Play Doh and coloring). I wanted the big guy to do something fun away from the television where I could feed the baby and also work on his fine motor skills. So we took out the beads that we bought the other day. 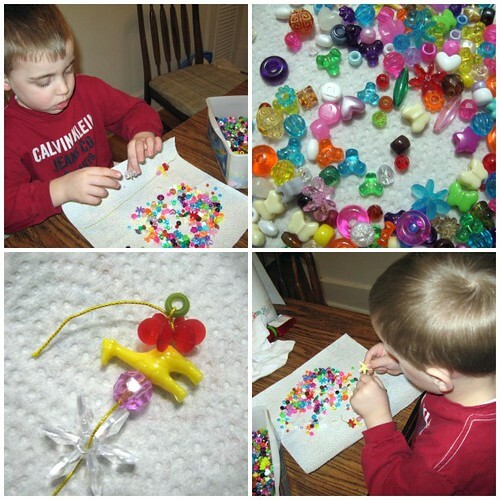 The plan was to make some things for NHL to give as Valentine gifts for special people, but he had more fun designing a masterpiece, looking at it, dumping the beads off and starting over. Over the entire afternoon he went back and forth to the beads 2-3 times and played for over 2 hours (at least). This was a wonderful investment for my sanity! 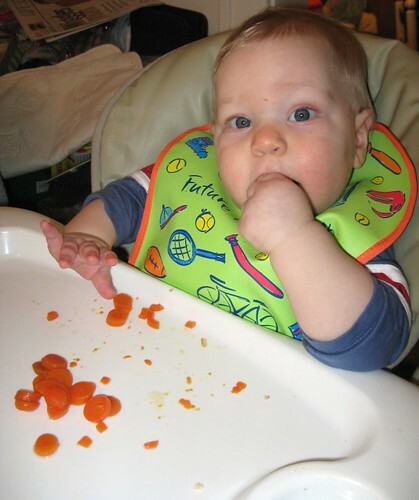 While NHL was busy with this JSL gobbled up his favorite food, sliced carrots. He loves these and chatted away with NHL while eating and watching his big brother. Meanwhile I was able to work on the magnets that NHL helped me to pick out the other day. 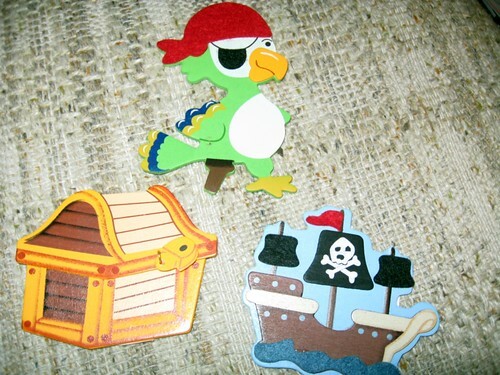 Check these out, they are really neat. 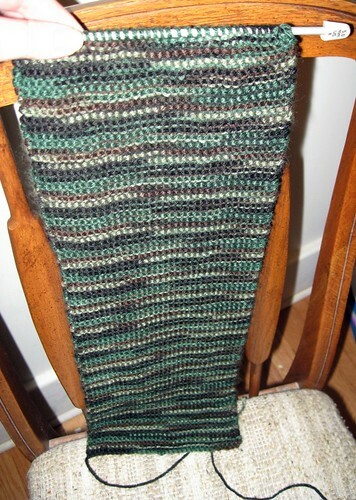 I was also able to do a little mindless knitting. Here is what NHL’s camouflage scarf looked like early yesterday evening. We had a nice afternoon together and with any luck it will continue today. If the ice is cleared up I may take the boys to Joann’s to get fabric for NHL’s flannel blanket that Madame Squishy Yarn Guru (aka Laura) graciously said she would make for him. Yesterday she told me they had some really cool Muppet flannel and when he saw a photo of it he wanted it (so did JL and I actually). « Another round of thanks!